Willa Keen is a student nurse at Larkhill Cottage Hospital who is determined to become a fully-qualified nurse. But when a timber lorry crashes and she goes to the aid of a trapped passenger, the timber falls on top of her and damages her spine. Now she is confined to a wheelchair, and her dream to qualify as a nurse depends on whether she will walk again. When Willa saves and revives a drowning girl during physiotherapy, it fires her with a whole new determination to walk again and become a nurse. The trouble is, the same determination leads to her making single-minded and stupid decisions to prove herself, and that wheelchair not only limits her access to the wards but leads to some accidents as well. The crunch comes when a patient with angina has an attack. Instead of calling the night nurse, Willa resolves to tackle it herself in order to prove she is still a nurse. And then she finds she can’t access the patient because of her wheelchair and her legs are useless. She falls and knocks herself out, and this puts the patient in even more danger and valuable time is lost. The patient is saved in the end, but Willa is in big trouble for not taking the proper course of action in calling the nurse. However, the board goes too far; they tell Willa she is just not capable of helping right now because of her condition and she must face the fact that she is not a nurse anymore. This shatters Willa and sends her into deep depression. Then Mr Leggett, the truck driver from the accident and his son Teddy step in and offer to take Willa on a holiday away from it all. Willa goes, but is in a state of deep depression and shows it by flinging her nurse’s uniform out the window. She is just as bitter and bad-tempered at the Leggett household and tries everyone’s patience. When asked to cook dinner, she grumpily refuses. So Teddy tries to cook dinner himself, and the result is fire in the kitchen. Another accident because of Willa’s attitude, and she herself realises it. But when she has put out the fire, she finds herself standing on her own two feet! It looks like she has made the breakthrough, and it is the end of her bitter attitude. She now has fresh hope and is more cheerful. Things are looking up. Willa is given a puppy, Benje, and asked to help out at the play-school. There she exhibits her nursing skills with first aid. But she is still wheelchair-bound and her legs give way under her. Then Willa gets a letter inviting her back to the hospital and there is a job waiting. Willa goes, eagerly anticipating a return to nursing. But she gets a nasty shock when she finds it is a clerking job! She gets all depressed and the staff realise they have made a mistake. Willa gets off to a bad start in her new job because her heart is not in it, but she soon picks up when the manager tells her it is not all just bits and pieces of paper – patients’ problems are in there too. She also meets Jim Cooper, a man disabled like herself but is being trained as a masseur. Despite his blindness, Jim soon finds he can play football with his other senses. This inspires Willa to sit the nurses’ exam, although she is not supposed to. This comes to a head when Willa is asked to come up and help with the blackboard. It means Willa has to walk up there – but can she? Her friend Gay manages to cover for her by taking her place. Willa comes top in the exam, but Matron says she still has to be able to walk if she is to be a nurse, and she is not likely too. This has Willa working far too hard in physiotherapy and collapsing. Eventually she manages to walk a bit, but then she overhears a surgeon badly needing a nurse for an emergency operation and none is available. Ever determined to prove herself a nurse, she steps in, determined to stay on her feet no matter what. She manages it and the patient pulls through, but then she collapses. This time it is the proverbial straw that breaks the camel’s back. Staying on her feet throughout the operation has damaged her spine again – to the point where it is beyond repair and there is no hope of ever walking again. Willa is utterly depressed, and none of the people who helped her before seem to get through. Her depression results in yet another near-accident, this time to Jim, and she steps in to save him. It snaps her out of her depression. Then she meets a new patient, Pamela Sutton who is wheelchair-bound like herself and seeing a specialist. The specialist’s verdict is that Pamela is now capable of walking and just needs motivation. Willa starts using what she learned in her own physiotherapy to help Pamela, figuring it will be the next best thing to walking again herself. This sets Willa on a whole new career as a physiotherapist. 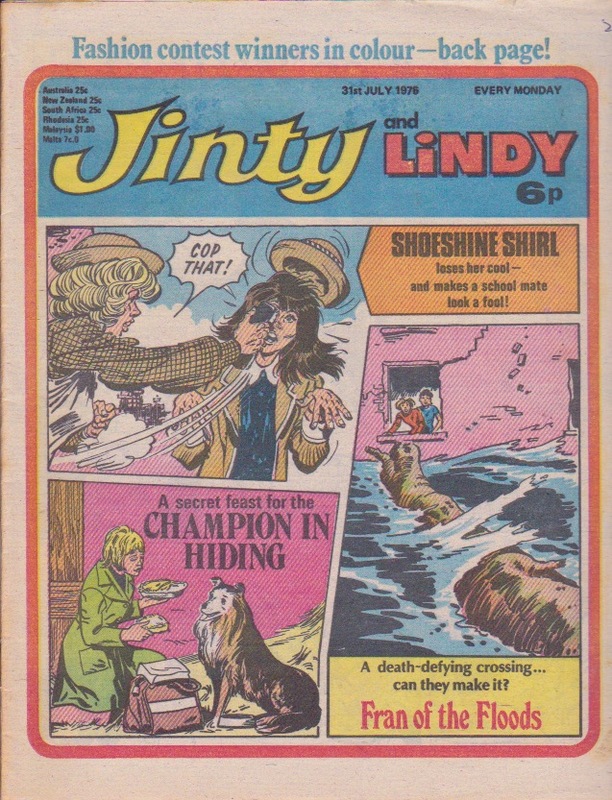 For some reason, nursing stories was one theme that Jinty was very short on. Throughout her entire run she ran only two nursing serials – this one and Angela’s Angels. 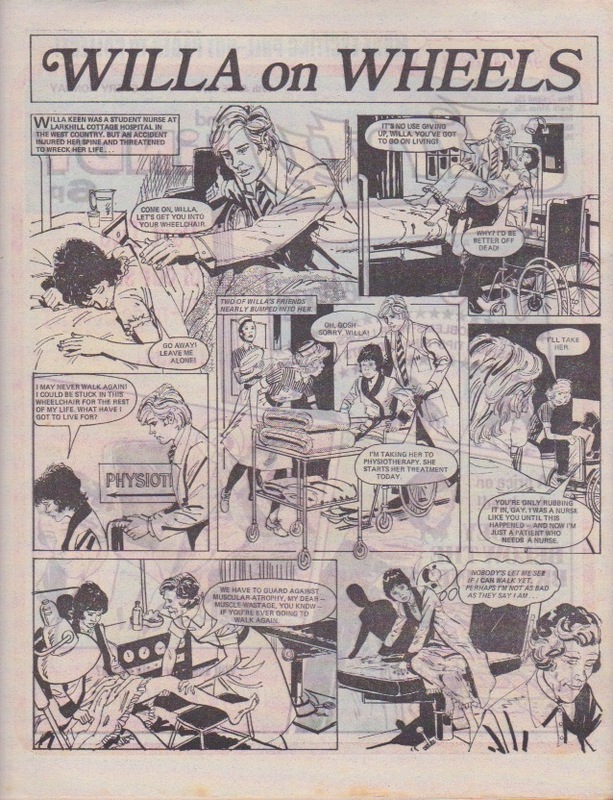 When readers in the 1980 Pam’s Poll asked for a nursing story, Jinty’s response was to repeat Angela’s Angels rather than publish a new nursing story. Stories where heroines are determined to make their own miracles with comebacks after an accident are well established in girls’ comics. But this story seems to be making a statement about what can happen when determination is not combined with common sense and crosses the line to pig-headedness and stupidity. Willa is so fixated on proving herself a nurse and gets so depressed when she can’t that she puts herself and others in danger several times. She realises her mistakes afterwards, but continues to make them because she is so hell-bent on proving herself a nurse. She doesn’t understand that the spirit is willing, but the flesh is very weak after the accident, and she should concentrate on recuperation before looking at nursing again. And in the end, it is that same reckless determination that destroys her chances of recover altogether, when she takes on the job in the operating theatre when her body was just not ready for it. It is not all Willa’s fault; some of it the way the medical staff handle her psychologically; at the board hearing they go too far and crush Willa’s confidence completely, just as she is feeling very bad over the angina patient (but will continue to make the same mistake). There is no counselling or psychological treatment for her depression and the mental impact the accident has had on her. The ending is a surprise; instead of the clichéd one where the heroine beats all odds and makes her comeback, Willa becomes permanently crippled but discovers a whole new vocation in the field of medicine. The skills she had learned in her own road to recovery are now being applied to others. But Willa is applying them in a more sensible manner than when she did with herself and, through the patients she helps, makes her own comeback. So Willa can be said to be a “comeback” story that is a very refreshing and even surprising take on the formula of “comeback” serials. It breaks all the clichés and gives us a heroine who is very human. Another sports cover by Mario Capaldi. The use of colour really brings it out in the way the yellow contrasts with the blue and purple backgrounds. It is one issue that does not feature Phil Gascoine’s artwork; his last story, “Tears of a Clown“, finished in the previous issue. Replacing “Tears of a Clown” is “Life’s a Ball for Nadine”, a story that is very unusual for featuring a black girl as its heroine. The Greystreet School netball team needs another good player, and they find that new girl Nadine Nash has a natural talent for netball. The trouble is, Nadine is more interested in disco. Sally and Sue are determined to bring Nadine over to the team. Can they succeed, or will it be a story of disco vs netball? Disco dancing is also big in “Sue’s Daily Dozen”; the magic of the Daily Dozen has a couple dancing like frogs in a disco contest and they win hands down! “Child of the Rain” approaches its climax. Ever since Jemma West hurt her leg in the Amazon, she has been filled with a strange energy whenever it rains. This has caused a lot of problems and now there is another – Jemma’s leg is suddenly hurting where the old wound used to be. Jemma won’t tell anyone in case she is pulled out of the tennis championship. But it looks serious, so how long can she hide it? The Gypsy Rose story, “The Face of Greed”, is a reprint of one of the more frightening Strange Stories. Tina Daly, a greedy, unpleasant girl, suddenly finds herself encountering a hideous, terrifying face in the attic. She is convinced it is an evil spirit come to punish her for stealing and hiding Mum’s jewellery. However, the title and opening blurb suggest it is a reflection of Tina’s own personality! In “Tansy of Jubilee Street“, Tansy is out metal-detecting, which provides a golden opportunity for a practical joke from Simon and Peter. It takes the form of a fake World War II mine set to detonation, but they did not think through the consequences – their prank has a bomb alert going out! And in “Gaye’s Gloomy Ghost”, Sir Roger tries painting while Gaye has a panic when she thinks she has turned into a ghost. “Girl the World Forgot” has another missed opportunity at rescue; a plane swoops over her but the pilot can’t see her because it’s bad weather. And to make it worse (though Shona doesn’t know it) her own father was on board as well. The incident inspires Shona to set up a beacon, but will it be her ticket to rescue? “Pam of Pond Hill” is into her classic story of her school trip to France. It looks like it is taking unexpected twists, what with a mysterious boy stealing Fred’s shirt and their food. One suspects he is a runaway, and whatever the circumstances are, they are sure to cause problems for Pam & Co. This is a good solid read even now! There are lots of articles and non-fiction items that are still interesting today (for instance Gypsy Festival, about a Romany gathering in Provence), solid text stories, and spooky comics (two short ones that look like they could be Strange Stories reprints, with the Storyteller panels replaced with descriptive text instead, and one longer one with malevolent ghosts and an annoying girl – “Fallow’s End”, very nicely drawn). If you like the short humour strips, the selection is quite good: three “Minna From Mars” reprints, two “Desert Island Daisy” stories that I expect are specific to this annual, and some two page Do-It-Yourself-Dot strips (in the weekly comic she normally only got one page). 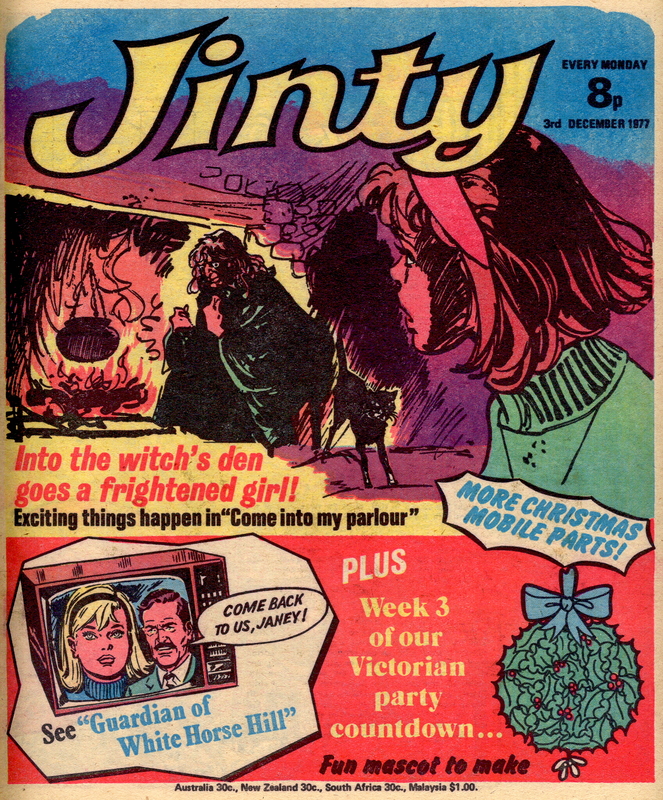 In the “Angela’s Angels” post, Mistyfan mentions the story included in this annual: “The Little Demon!”. The story only features two of the group, Sharon and Jo, who travel (with the little tearaway who is nicknamed a little demon, and his mum) to a remote Scottish island. We now know that Phil Townsend worked with original “Angela’s Angels” artist, Leo Davy, on another nursing strip, so it makes sense that he might have taken up the reins in this case too. I’m interested to see some other outings of artists who are not normally associated with the long-running characters they draw here: Jim Baikie making a good fist of doing “Dora Dogsbody” – Ma Siddons looks as mean as ever, though Dora ends up looking more sweet than cheeky – and Audrey Fawley drawing Katie Jinks. “Her Ugly Duckling” is a different artistic twist – it is a Casanovas strip, but one which I think might be reprinted from an earlier time (the characters are wearing very 60s styles). He has gone for a dreamy, romantic art style and the story is likewise one with a hint at the end that a boyfriend may be in the offing, though the main theme is about rivalries and a ladette-to-lady story. 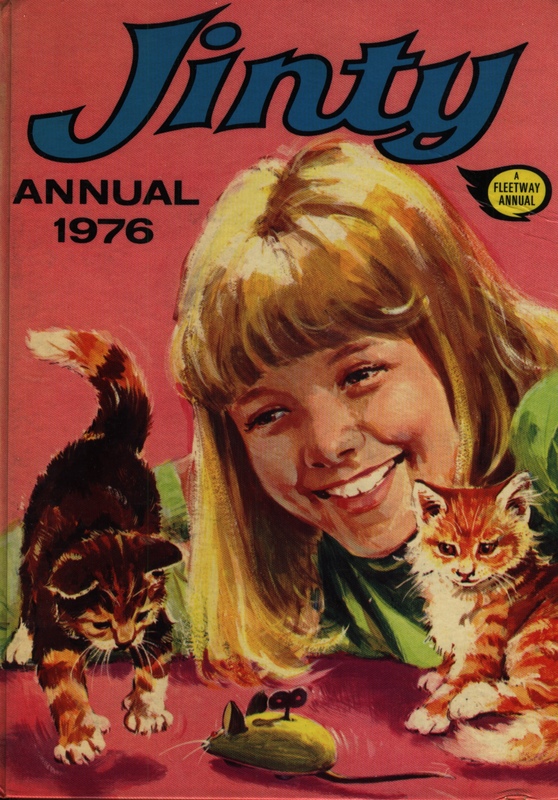 A personality quiz was a popular item in all sorts of the publications a young girl might read – here you can see if you are a Whiz Kid or a Stick In The Mud, or find out your secret self. These are light-hearted silly items with some undertone of a moral imperative – if your secret self is a mixed-up jumble of all the other types, you are not praised for your moderation but exhorted to choose one type and suppress the less pleasant sides of your personality deliberately. You may have seen that Terry Magee made a series of illuminating and interesting comments on the Len Wenn post: these described the processes and principles behind script conferences in more detail. To make them more visible and easier to find in the future, I repeat them here. Many thanks, therefore, to Terry for sending in these details! Len had worked on Fleetway boys’ comics in the 1950’s – either The Sun or The Comet, knew artists like Geoff Campion and colleagues like the famous/infamous Sid Bicknell (Uncle Sid to some). Len was a very fair chap and encouraged me to write. He was a soldier in the North African desert in the Second World War, telling me some of his experiences such as having to dig trenches in the sand – with the danger of being buried alive, which he actually saw happen. He told me other things about the Fleetway crowd that I can’t repeat. and continued writing for Mavis on Jinty. They were a good team. As for their script conferences, they happened around every six weeks or so with just two writers on separate occasions – Frank Redpath (Lucky’s Livin Doll) and Jack Johnson (very talented writer and great bloke). I only ever was at one script conference, but didn’t contribute much as Mavis and Len were too good to keep up with! Fleetway was a friendly company, the opposite to the dreadful DC Thomson. I never worked there, but heard tales from those who did, like John Wagner. DC Thomson was owned and run by two old brothers who were right control freaks – no staff allowed to use the phones unless with permission. The two brothers didn’t talk to each other for years, communicating notes slipped under doors and so on. They lived in a mansion outside Dundee, one in the east wing and the other in the west wing. A weird story itself! Shiver me timbers!, as Captain Hurricane would say! Thanks for this, Terry! Can you tell any more details about the script conferences themselves – if writers weren’t normally present, then what was the aim of them – did Mavis and Len use them to write their own stories, or to decide general ideas that they would send on to freelance writers, or what? My pleasure, shipmate (still talking as Captain Hurricane whose letter I used to write in Battle comic for some years)! I was only the one time in a script conference and that was In Mavis Miller’s office along with Len Wenn and the author Jack Johnson (might have been John Johnson). They discussed ideas and plots for Jack’s stories for June & School Friend. I think he wrote three of them every week. They were plans for something like next 6 weeks’ episodes. It was the same for Frank Redpath and Lucky’s Living Doll (the most popular number one in June & School Friend). I used to hear them talking quite loudly and excitedly with lots of laughs through the wall of the office next-door. I was sub-editor sharing the office with Art Editor Colin Parker (we could see the Scales of Justice statue of the Old Bailey from our window). In the next office along was other sub-editor Jackie Davis, who was engaged to Colin (they eventually married) and art assistant Roger Prickett. Colin went on to become Art Editor on the Daily Express. His elder brother, Jack Parker, was Editor of Look & Learn. Very talented people. Fleetway (basically still the former Amalgamated Press), was packed with gifted journalists, authors, artists, both staff and freelance. It was positive-thinking and forward-looking, which is why John Purdy was able to bring in new people like Gerry Finley-Day and Pat Mills with new ideas. Although it was done surreptitiously and that didn’t go down well at Fleetway. I was there and I saw it happen! Other authors for June & School Friend were freelance and hardly ever came in to the editorial offices and sometimes never, as was the same for artists. Although Scott Goodall, freelance author, was often there, thumping away on a Bluebird typewriter at any spare desk going. They were referred to as authors in the Fleetway days, not writers, and the word ‘comic’ wasn’t used. They were girls’ papers or juvenile publications, sounding more adult and serious… Knockout and Buster were comics, due to their humorous strips. Freelances were also paid in guineas, not plain pounds. We were paid salaries, not wages, with accounts in Coutts Bank of the Strand, the Queen’s bank and very posh… Fleetway could be snooty copared to D C Thomson, who seemed more down-to-earth although weird as I eventually discovered. Fleetway/IPC artists were better, more arty and often really fantastic. for Look & Learn. There were no restrictions on freelancing for publications. I wrote Tarzan and The Saint for TV Tornado while subbing on June & School Friend. Fleetway and IPC were always trendy, being in the centre of London where it was all happening (or supposed to be happening!). There were lots of women’s magazines in the building like Woman, Woman’s Own, Options, Woman’s Weekly and others I can’t remember, plus cool mags like Rave and Fab 208, so we’d often see famous pop stars like Marianne Faithful, The Beatles, Adam Faith and so on. It was glamorous! Mavis Miller didn’t write any stories or features, she concentrated on the editing. Len Wenn didn’t write anything for June & School Friend. Maybe he did for his new paper Sally. 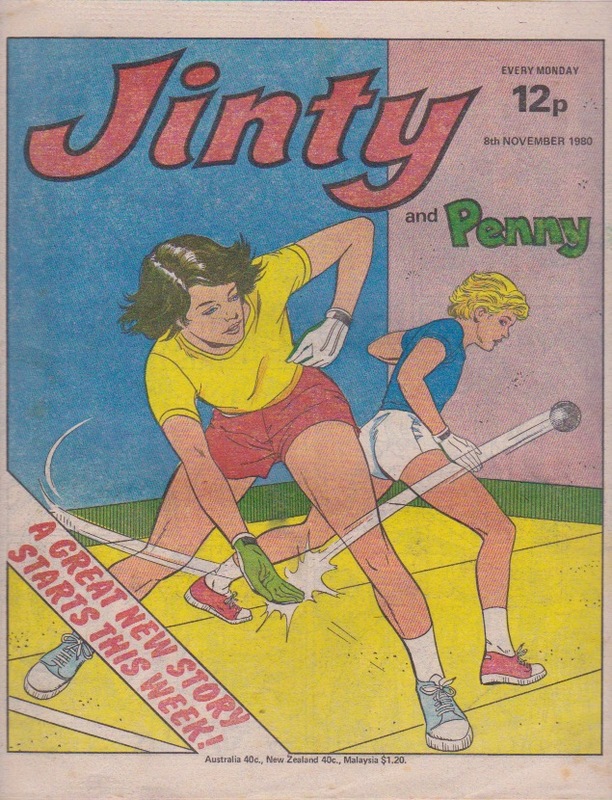 Just remembered: staff member Cecil Graveney used to write Bessie Bunter and Sindy (toy doll). Cecil was old Amalgamated Press, in his late 50s or early 60s then. Mavis in her 30s and Len in his 40s (I think – I’m terrible at telling ages). One artist who occasionally drew illustrations for features was in his 80s. A jolly chap with a big smile who reminded me of Father Christmas. I regret not remembering his name. When you think about it, he must have been drawing for Amalgamated Press in the 1920s and have known people who were at the very start of ‘comics’ in the 1890s. His artistic style was still very 1920s. A real link with the past and great to meet him. Of course, there were dark sides to Fleetway/IPC. Not sure if I want to go into that! Thanks again to Terry for sending in these memories and explanations. 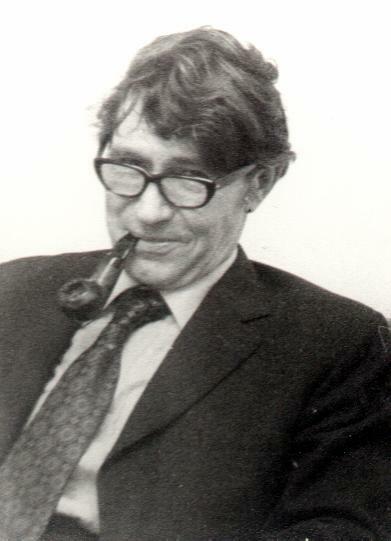 Len Wenn (1918 – 2003) wrote various stories for Jinty, as confirmed by Keith Robson in this comment. At present the list of his confirmed story titles is very minimal; if further information comes in we’d love to add to it in the future. In fact the two stories we have confirmation that he wrote are not only solid, memorable Jinty stories, they have a lot of bite to them. “Go On, Hate Me!” is a powerful grudge/revenge story that wraps up well; the shorter, to-the-point “The Birds” has strong horror elements that make it genuinely scary at points. If he was too gentle for the changes in the working environment as Terry suggests, he certainly could write to the spec of the newer breed of comic that was represented by Jinty, Tammy, Misty, and the like. The idea of multiple collaborators within the editorial office working on script conferences is intriguing. Alison Christie has confirmed in her interview that she had very little editorial direction, which I assume would be because she had already proved herself as a trusted steady hand, capable of delivering solid stories to schedule. Were the in-house script conferences to determine the suggestions that might be made to other less trusted writers, or to propose girls-story takes on big hits from books and tv, or just to write their own content? 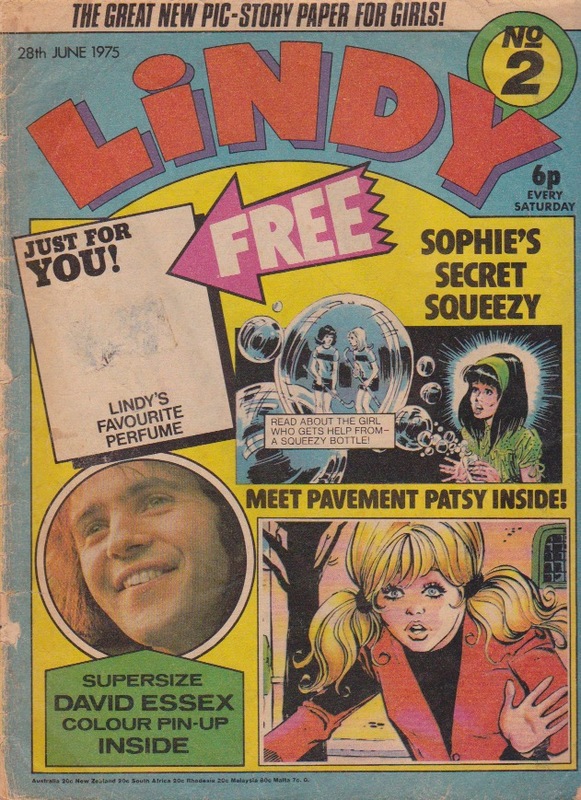 There were so many pages to fill alongside the comics stories, from ‘hints & tips’ features or non-fiction articles, plus text stories, that this must have kept the editorial team pretty busy in any case. The collaborative aspect of story writing in those conferences was a gift that must have been limited to only specific cases, given that most freelance creators never met each other. “I was always wondering when any of [the titles] would be merged or axed. 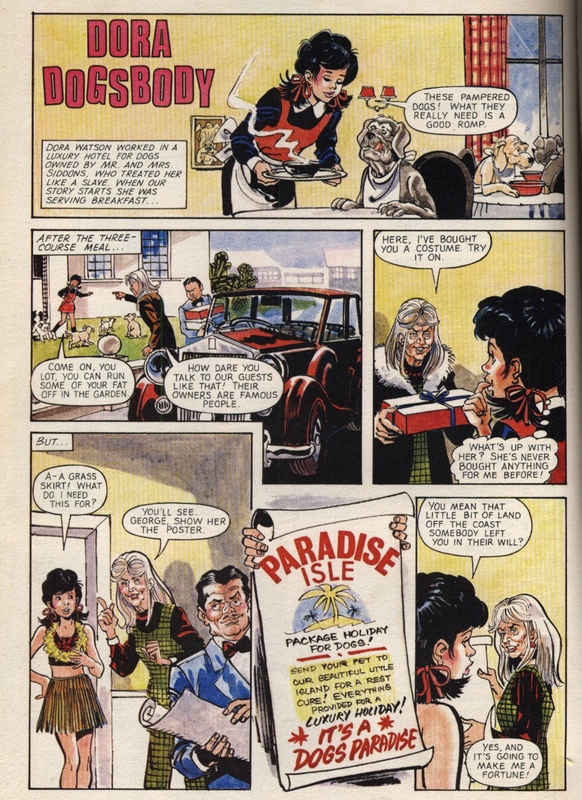 I appreciated working for IPC, they paid so much more than DC Thomson’s did. I had to join the NUJ, though – which Thomsons, being non-union, abhorred. I could do that, of course, as I was freelance. But some employees of DCs were in the NUJ, and held clandestine meetings in Dundee, which I attended. I didn’t realise until I’d read Keith’s interview that while working in IPC, he was able to freelance for other papers, including DCT’s. No way could I have done that while working in DCTs, or Keith either. There was the sword of Damocles hanging over you if you were found out and possible sacking would ensue.” So IPC paid better and was unionised, but then of course it also suffered from strike action, and from the pernicious policy of hatch-match-dispatch, at which point the creators, and presumably the editorial staff, could suddenly find themselves in the suds. Ending up as editor of long-running title Buster, Len will have been reasonably safe from these dangers, though one assumes the feelings in the office could run pretty high at those times.